Early this spring, my good friend and gardening buddy, Anne, shared an amazing thing that was new to me: a documentary about a gardener and his methods, which result in an absolutely gorgeous and productive garden. Paul Gautschi has developed an organic gardening system that has garnered attention from around the world. He has also, I’m sure, set into motion the scrambling of thousands of crazed, weed-tired gardeners like myself, to scrabble and search for cardboard, old newspapers, and wood chips. With a maniacal, “sick of weeding” gleam in their eyes. Don’t look too closely in my eyes these days, by the way. Perhaps you’ve heard of Paul and his “Back to Eden” film, but if you haven’t, you can take a look at it here. If you’re a gardener who struggles with weeds summer after summer, then you’ll be doing yourself an enormous favor to watch this film. 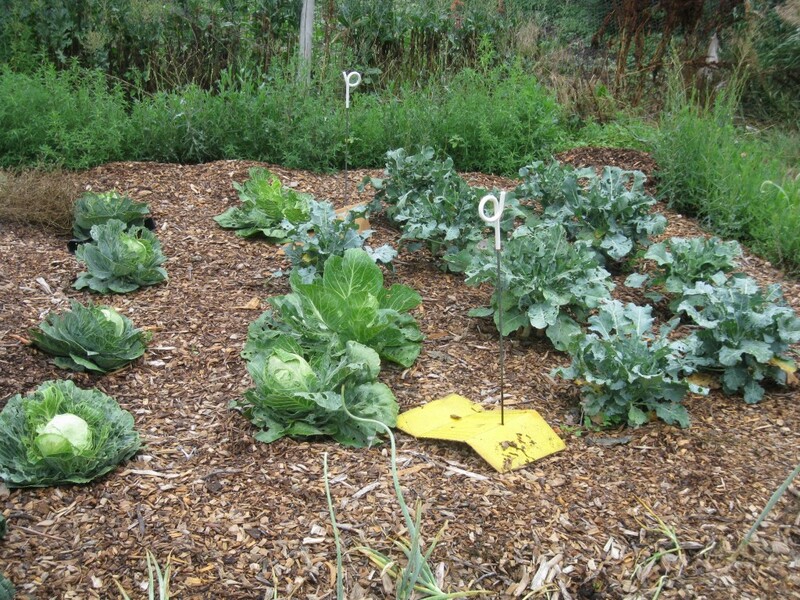 Paul has developed a system, using layers of newspapers or cardboard and large amounts of woodchips (or other mulch), which nearly eliminates weeds and makes a very rich, friable soil full of nutrients and beneficial critters. He does all this while listening to God and giving Him the glory, too. The film is inspiring. I wish Paul were my neighbor. I really do. Maybe he’d help me find a large mountain of woodchips for my garden. Paul uses scripture freely in his film, and one scripture that he uses is Zechariah 4:10: “Who despises the day of small things?” Laying newspapers and wood chips on your garden space would be a small thing that could develop into a wonderfully big and fruitful thing. And much less time weeding. Early this spring, I had a dream of trying out Paul’s method of mulching–I am, after all, quite a devotee of mulch, and a passionate non-devotee of weeds–but when planting time opened up before me suddenly, I had no woodchips and couldn’t find a source for them. Instead, I bought a couple of very large bales of mulch hay, and determined to mulch the heck out of my garden with them. Which I did. Most areas. Well, okay, I did for a while until I got too busy planting to mulch so much any more. The seeds took precedence, as it were, and so now . . . there are weeds aplenty which I can pull up and use to wipe my tears away (velvet leafs, maybe . . . buffalo burrs, not so much) as I weep pitifully over the fact that I didn’t follow through and mulch deeply everywhere. But my friend Anne took the high road . . . she and her husband bought loads of woodchips, and gathered up armloads of newspapers, and then piled them all on their garden space. I asked her to keep me posted with the results of her “Back to Eden” experiment, and she was very good to oblige. Here are some photos (which speak for themselves, in my opinion! ), and some questions I asked Anne about her experience. 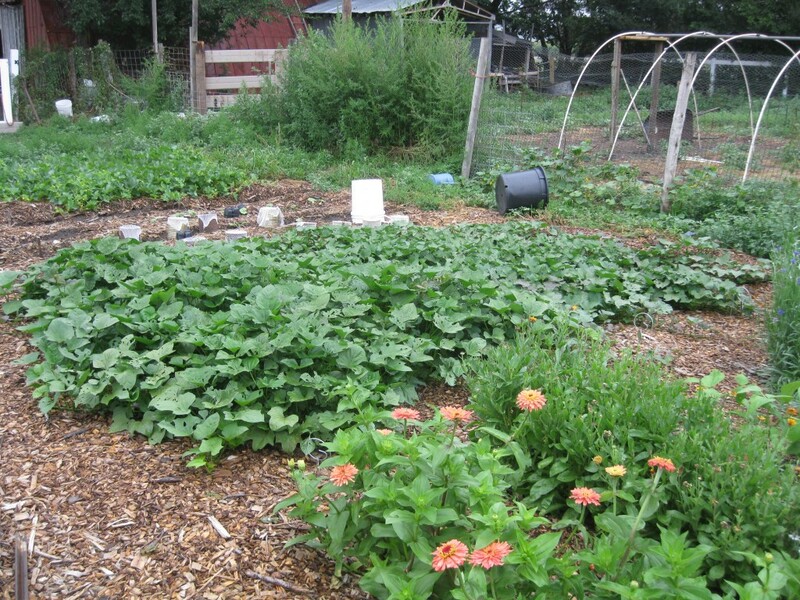 Question: What was the best part of doing your garden this way? Question: How much newspaper (how many layers) and how many inches (on average) of woodchips did you put down? Where did you find these materials? Question: How did your crops perform this year, compared to prior years? 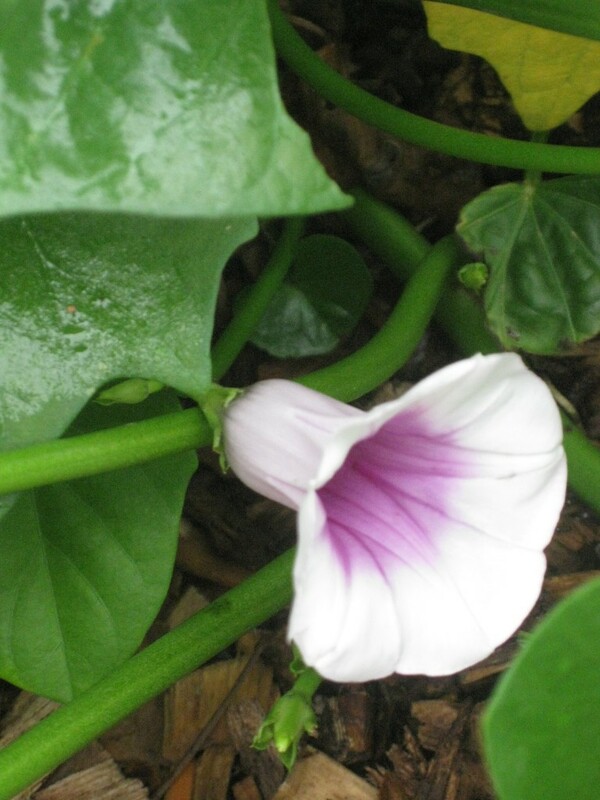 This is a blossom on a sweet potato plant, which, Anne says, means the plant is very happy indeed. Question: Will you use this method again next year? 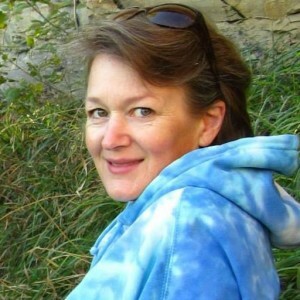 I want to thank Anne again for letting me share her experience with you all. (Also, Anne, I want to hear about those sweet potatoes, once you dig them!) I’ve been watching her experience closely this year, wondering if it would be worth it to go to that little bit of extra trouble to gather woodchips and newspapers and spread them next year, before I plant the seeds. In these weedy days of August, I am quite convinced that it would be worth it, so I’m planning to watch out for a quantity of woodchips for my next year’s garden! By the way, after Anne and her family harvested their sweet potatoes, I wrote a follow-up post to this enthralling garden story. Check it out right here! 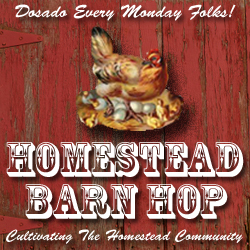 I’m linking up again with The Prairie Homestead Barn Hop this week, with oodles and gobs of great homesteading-related posts! Take a look if you’d like some more informative and inspiring posts! ← Firstfruits from the Hoophouse: pak choy! Thank you for posting this. We have started our Back to Eden garden but like you, have had a hard time finding enough wood chips to get the job done. I would love a tree service that just comes to my house & dumps them on a regular basis but no such luck. We can have a few delivered occasionally but not where we need them (in the Country vs the City). We have agreed that this winter, we will have chips delivered in the City & load them up in 500 lb rock bags & take to the Country to lay down a little at a time. We only get to the Country House every other week & I just can’t believe the weeds actually seem to get stronger as the summer goes on, especially w/all the rain this year. I don’t need to plant until 2015 so I am hoping to get a leg up, so to speak, this winter & start fighting those awful strangling weeds. Especially the Bermuda grass! I’ll have to check out that film — I am always looking for organic gardening resources. Thanks!! Anne’s garden looks amazing! I wonder about the newspaper though — isn’t their lead in the inks? Awesome! We will be checking out the Back To Eden method! Caro, it’s quite inspiring, I think you’ll agree! What an inspiration to see the beautiful vegetables growing beneath the neat covering of mulch. I used this method of grwoing everything in the 70’s and 80’s. My husband and I bought a shredder and collected garden refuse, cut branches etc from neighbors. In our last garden built together in Queensland, Australia, we planted trees, palms and ferns in the space where a front lawn would normally spread, with paths throughout between the growth. All mulched under chips gleaned from others. Wow, Francene, that sounds perfect! I’ll bet it was absolutely beautiful! How amazing is this. I long for a garden like this. We have a modest crop this year but boy do I have plans for next year 🙂 Thanks so much for sharing this. Anita-Clare, an optimistic gardener will always dream about next year’s garden before this year’s is put to bed . . .
Great information, and our local park service has tons of wood chips we can get our hands on. To bad I am leaving, but I will instruct one of our daughters that loves to garden and will be staying at our Wisconsin home for the next year while we are in Mexico. She is a mulch happy person as well, so her and her husband ready treat the soil to all the good stuff it needs. I would imagine that they use chippers down in Mexico, too, Si?? I think it’s worth the trouble to search them out! I watched the Garden of Eden movie this morning and loved it. I plan on calling all the tree trimming services I can find in the area and look for a supply of wood chips. We experimented in our raised beds this year with a similar set up using newspapers, chicken manure and straw. It has been a HUGE success. I planted sweetcorn, beans and squash using the three sisters method and the crops have been fantastic with little weeds. Am expanding it to the rest of the garden next year. Gillie, that’s fun to read! I planted TWO of the three sisters–corn and pumpkins together, and the corn has gotten so big that the pumpkins aren’t sure what has happened to them. But I’ve got one BIG one and that has made my little Mack very happy. I’m happy to hear of your success. I think so much of successful gardening in the fall has to do with your preparation in the spring: using the manure and the newspapers and straw really set you up for success! Well done! It does, indeed, look very successful. I especially like the idea of not being in mud after a rain. 4 layers of newspaper, huh? Am making a mental note of that. Wait … better write it down. If you are concerned about ink, you can do as we did and use cardboard. Refrigerator and other large appliance boxes covered a lot of space with far less trouble with the Oklahoma wind than the newspapers would have been. Just call ahead to a big-box store and ask them to hold some for you. Great idea, Kristen! I’ve used some cardboard in my garden, but I’ve never had a quantity of it. And there are people who wonder about the glues in the cardboard. What do you think about that? WOW that sounds like success to me, Jenny! Well done! Beautiful! I just recently watched the film as suggested by my MIL. Ironically I planted in woodchips this year just because that’s what the previous owners left for the ornamentals and I ran out of time to remove it all and replace with “conventional” method organic potting soil. So we’ve had great results so far but I’m curious about a square foot garden/back to Eden approach. All the rows seemed quite far apart in the film and some of the pics here. We have a very small front yard (which gets the most sun and where I’m growing veggies now) and I’d like to use all the space I can to cram as many edibles and beneficials as possible. Any thoughts on cramming enough in and still keeping plants happy? I’m not very acquainted with the sq/ft gardening, but I always tend to plant everything very close together in my own garden. I admire my friend’s wide open spaces in her garden, but I think you can cram things together closer and still have a very productive garden. You’ll need less mulch that way, and as the plants slightly overlap, weeds won’t have as much room to grow, either. Just don’t crowd them too much (like I tend to crowd my tomato plants) or you’ll have diseases resulting from lack of air circulation and competition for water and nutrients. Good luck with your garden, and let me know how it grows! I’m a little late to jump in here, but I’ll go for it anyway. Since this was experimental, I did not plant as much this year, and left more space between things. And this may sound strange, but bare earth looks different than woodchips, and it threw off my ‘eyeball it’ spacing method. (I miss the feel and look of the bare earth, but I’ll sacrifice that for fewer weeds for sure!) So, I most definitely could have planted some things closer together, and will do so next year. However, I have been amazed at how the garden has just sort of closed in on itself. If you could see a picture of it now, there is very little room to walk without walking on plants. I, too, send best wishes for you as you experiment and discover what works best for you! Regarding newspaper inks, in our eco-friendly college town, all the inks are veg based. You can always call the company that prints to ask–or better yet get blank paper rolls right from the printer (free). That’s what we’re laying down–long, long sheets of paper. Much nicer than dealing with overlapping all those newspapers. You get free blank paper rolls from your printer? Now that sounds like an very worthwhile thing to search out! Thanks for the tip! I’ve been doing BTE gardening for 8 months and the difference is phanominal (sp?). My sweet peas grew up on my fence, then taller than me, fell over and started to grow back up again! We had red and green peppers taller than me! The crops we yielded were awesome. The secret to this type of gardening is you MUST have some kind of fertilizer, also. As Paul uses chicken manure, you must too, weather it be fish emolsion, blood meal etc… Otherwise, it may be difficult to continue this kind of gardening. Happy gardening! Thanks for your insightful comment! I’m going to try this next year in my own garden, if I can find enough wood chips before then! I appreciate your tip about the fertilizer. Do you (and does Paul) put the chicken manure on underneath the woodchips, or does he top-dress? He just layers when he has time. When he takes up the chicken manure from the chickens, it’s not as hot as fresh because he puts woodchips down in his chicken pen. So it’s not as strong when he puts it on his garden so he puts it directly on top. Less work is better! My problem is getting chicken manure where yours might be woodchips, so I am using mushroom compost placed on top. 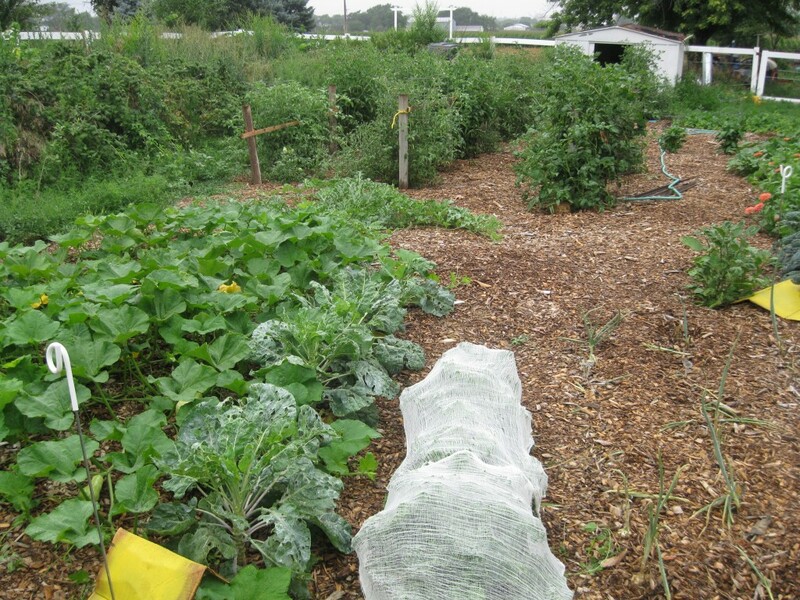 I did not start my garden with woodchips, I placed woodchips on my existing garden. I had a pile of woodchips that sat for 1-2 yrs and I put my pitchfork in it and got three worms on one shovelful. Amazing! Go to youtube and listen to all the videos a guy took when he went to visit Paul. Taking your time to listen to them will educate you to another level. It’s L2Survice. Enjoy! Thank you so much for this. And thanks so much for reminding me to go back and watch that video again–with the videos the guy took who went to visit. I’ve never watched them, but now I’ll be sure to do it! It all is so inspiring to me! I really appreciate the info. Your welcome…Lord Bless your garden! Enjoy his beautiful work! PS…I took some potatoes and placed them on my garden ground and covered with 8 inches of woodchips and got the most beautiful potatoes ever! I did fertilize them once as it was the first time doing potatoes. My neighbor was shocked when she saw this. No tilling whatsoever! Haven’t tilled in over a year and loving it! Also, the longer you do this method, the less weeds you will have because you are not disturbing the ground to expose them to the light! I pulled 10 weeds the whole summer. That’s what will keep me hunting for wood chips for next year’s garden, cookin’mom: 10 weeds the whole summer. Incredible and amazing! I’m sorry…I made a typo, it should be L2Survive. Hi, how do you plant seeds into the soil beneath the wood chips? Do you need to expose the soil for some time or will the seeds find their way to the top anyway? In the beds where I have heavy woodchips, I rake the woodchips aside in order to plant. Then once the plants are up, I rake the woodchips back around the plants. I’m confused. If you put layers of newspaper on top of your garden space and then top with wood chips, when you rake the wood chips aside to plant, are you tearing through the newspaper layer, or did you put compost matter on top of the newspaper and under the mulch? I watched the video and would really like to try this but the cost of bringing in composted matter is financially staggering and prohibitive. I could layer newspaper and buy a dump load of wood chips for $100, but then how do I plant?? I also have never had the time/resources to do the “Back to Eden” garden properly. I do a corner here, or a section there. And I personally think it works best to layer the newspaper and woodchips in the fall, so it gives the paper time to rot a bit. Ideally you want the newspaper and much of the wood chips to be nicely rotted and turning into lovely friable dirt! You certainly don’t want to plant your plants in raw woodchips, so when I do this, I rake aside the areas that I want to plant, and dig down into the dirt below, making sure that I’m planting in the dirt underneath the woodchips, rather than in the woodchips themselves. My suggestion: Experiment with a small area of your garden to work the bugs out before you commit the entire space. 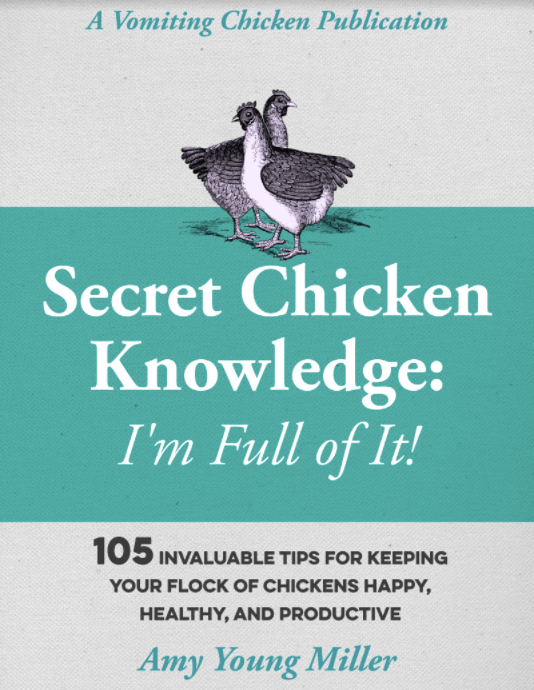 i’ve just discovered vomitingchicken and am thoroughly enjoying lots of reading here today. I dont have much time this year so will plant and wish everyone well to fend for themselves bc i lack the time to tend! ‘love the idea of woodchips but i have a strong belief that i’d just be creating endless haven for my nemesis, the slugs! does anyone with a slug-prone patch use woodchips/other mulching methods and still have veg to show for it? I’ll also ask my friend Anne if she ever has problems with slugs! I watched the Eden video and loved Paul’s wisdom: learn what pests have to tell you. I’d really enjoy feedback. Good for you, Lyn! You sound like a wonderful problem-solver. Very inspirational thankyou. Hope mine will be as good.